Le Corbusier once said "I prefer drawing to talking. Drawing is faster, and leaves less room for lies." This modern-day design genius planned Chandigarh, the city in India where I began my own artistic journey, and I often think about his quote when I sketch live scenes on a busy street with fellow artists. When sketching in a city, I often have a clear goal to paint a scene from a busy street. I complete a sketch by adding details, highlights and architecture in the background to set the tone of a street. Demands of people moving in all their different directions—to the grocery store, to a friend's house, to a train station—are all balanced with the need to sketch a live scene. 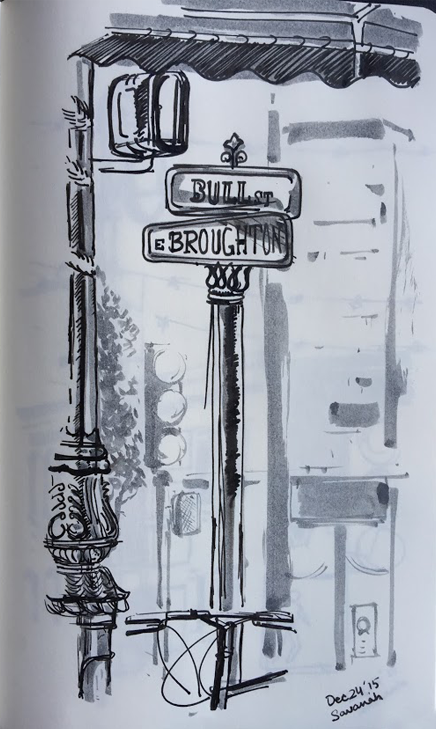 Sitting on the street sketching, I discovered drawing to be an instant form of art that I could quickly obtain feedback on... What a sense of accomplishment to share a sketch with a fellow artist! Over time I saw similar experiences and results from sketching during meetings. I started sketching during meetings when our team was brainstorming. Ideas would fly from everyone in every possible direction, much like the people moving on a city street. I would quickly scribble these ideas, collecting and organizing them as they appeared on my pad. Often during this process new solutions would emerge as unique elements within the sketch. From this, I would continue sketching, further refining the solution while engaging colleagues and clients attending the meeting. At the end of a meeting, I had clear notes of what was discussed, and sometimes even early sketches for a product. Over time I discovered these clear benefits to sketching in meetings. The act of sketching keeps me engaged in a meeting. :) With a pencil in hand, I am the guardian of a meeting, documenting and visualizing the ideas discussed. To do this, I listen closely to what everyone says, carefully documenting each idea. Sketching helps me to follow along with conversations and, after the meeting, I retain a clear understanding of the ideas discussed. This is not just my experience. Research shows that people who are quick to draw have better recall. An often-cited 2009 study found that doodlers could recall 29% more information than non-doodlers. In her TED talk Doodlers, Unite!, sketching expert Sunni Brown says the enhanced focus and recall is because doodling activates all four sensory prompts we use in retaining information: reading/writing, kinesthetic (touch), auditory and visual. And the focus isn't just mine. When there is sketching in a meeting, engagement soars collectively. Motivated by how quickly contributions become tangible, team members and client stakeholders openly share more ideas and feedback. Sketch in your next meeting. Watching ideas become tangible inspires people to share more ideas. This engagement fuels idea generation. When it comes to explaining ideas at meetings, many people, especially creatives, are often at a loss for words. Many designers feel comfortable sharing their visual work, but become shy when asked to verbally express ideas. When we're ideating in a meeting, we're sketching too. That's because sketching is inclusive. It still documents the ideas spoken during the meeting, but it also invites contributions from team members who prefer visual expression. There are also times when spoken words limit the product. Words, at times, seek to define boundaries. Sketching pushes those boundaries outward so other ideas can be included. Sketching pushes us beyond the obvious solutions to a problem so that we can explore more innovative ideas. Sketching pushes us beyond the obvious solutions to a problem so that we can explore more innovative ideas. Without sketching, the potential for lost opportunities is high. The only ideas pushed forward come from the people who prefer talking. And we know the best solutions for people aren't always from the loudest voice in the room. 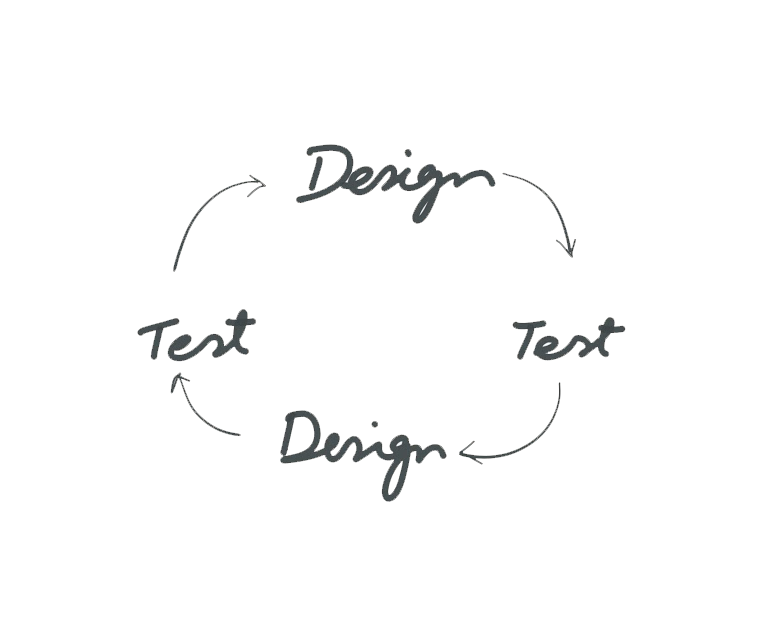 In our design process, finding the best solution for people means having a wide range of ideas to test. Sketching gets us that range. After collecting a range of ideas, fast feedback helps us to quickly refine and identify the perfect solution. With sketching, we bring instant feedback into the meeting. During meetings, we share our sketches and exchange real-time feedback that we immediately act on to further refine our ideas and bring them closer to prototypes that we can test. With sketching, creating and iterating take place in the conference room, significantly shortening feedback cycles. Within one meeting, some designers can go through multiple feedback cycles. 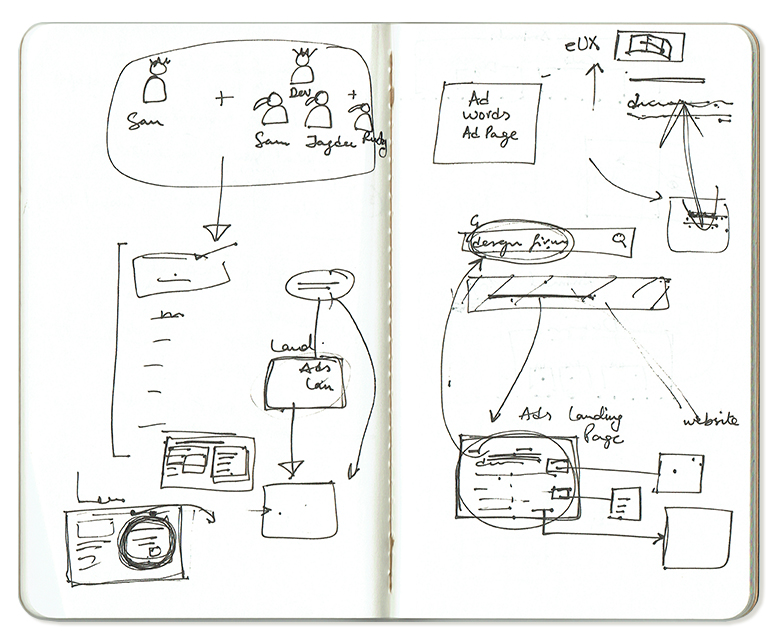 Sometimes the process is so effective that ideas enter the meeting and leave as sketches ready for sharing with users. Sketching, like other forms of design documentation, drives a product forward and leaves a historical record of the project's evolution. It's exciting when elements of a sketch created in initial meetings make their way into the final product. Of course, many products evolve greatly over time from initial meetings to launch, with repeated sequences of design, test, design, test. Sometimes those user tests force a meeting with an agenda to drastically change the product's design. In these meetings, sketching out new designs often removes the fear associated with a large, but necessary pivot to a product design. At Intelligaia, sketching makes up a significant portion of our DNA. And with amazing results. Still many organizations do not yet see the value of sketching. But that's changing. As organizations seek innovation, their leadership is increasingly open to processes and exercises that generate creative ideas. If you're tasked with driving innovation within your organization and looking to build a sketching culture, start in the conference room. Let skeptical leadership witness how sketching transforms a meeting into a results-driven collaborative working session. If they're worried about the perceived time involved in sketching, invite team members to draw ideas beforehand, and then block out meeting time for feedback and iterations. Alternatively, place someone in charge of creating an assets library on a digital tablet ahead of time. Then you'll have recurring shapes and images that can be easily copied and manipulated during the meeting to quickly visualize multiple ideas. 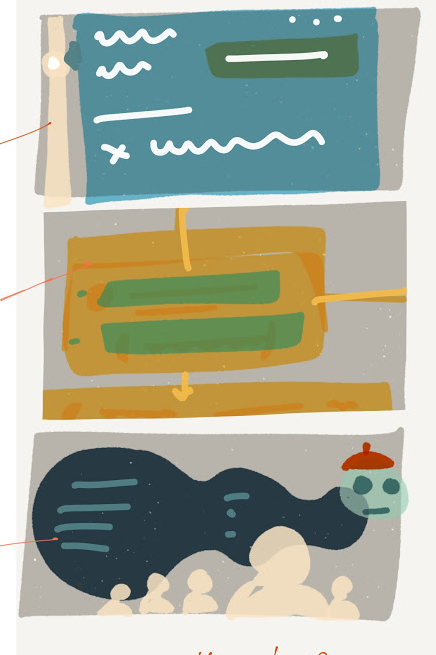 Embrace digital forms of sketching too. 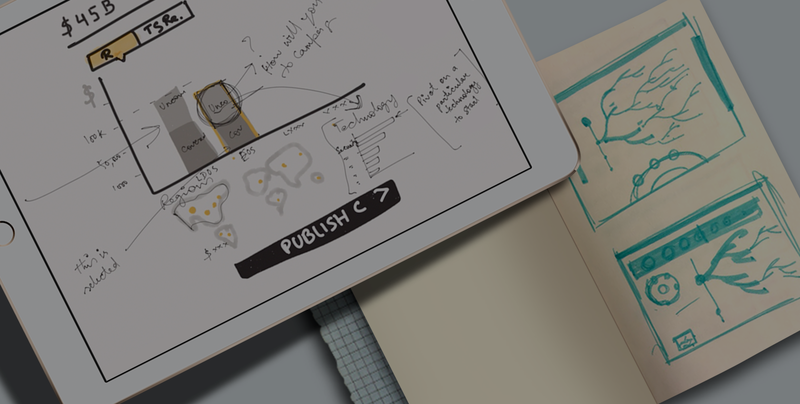 Sketches on tablets become screenshots and images that can be effortlessly copied and distributed to other team members for iterating and annotating on their own devices. Of course, if your team feels more comfortable using pencil and paper to express ideas, then keep the pads accessible. Paper or digital, it doesn't matter. Just sketch during meetings. Your company depends on innovation to thrive. Don't leave the conference room with untapped ideas on the table. Unlock big ideas with these sketching secrets!